"I think math is the subject with the greatest gap between what we know works from research and what happens in classrooms." Jo Boaler used her plenary session as a plea to the research community to not only do good work with their research, but to find ways to make it more shareable. "New knowledge is not enough," says Boaler. As part of a presentation she made at ICME in 2006, she surveyed teachers from countries around the world, asking, "What research study has made the biggest impact on your practice?" She found that in the Netherlands, the Freudenthal Institute has a huge impact in classrooms, and the Centre for Research in Pedagogy & Practice has a similar impact in Singapore. But often in other countries, including the U.S., teachers often cannot tie any of their practice to an influential body of research. That doesn't mean that U.S. research hasn't had an impact on practice. When Boaler asked math ed researchers, Jeremy Kilpatrick pointed to Cognitively Guided Instruction (CGI) for having a long history of helping elementary teachers and their students. Boaler found other examples, but they were all from elementary. She suspected that elementary teachers are both eager to learn about students' mathematical learning, and they recognize the enormous capacity for learning they see in elementary students. Boaler pointed out one of the tensions of sharing research: Just as we know students don't learn simply because we tell them something, teachers don't learn simply because we hand them a journal article. "I am really sure that teacher learning, one thing about it, needs to be generative and we need to be giving teachers things they can take back to their classroom and continue to learn from." Boaler also recognized doing research in partnership with teachers is probably the gold standard, both for identifying questions that are really important for teachers and working along side them. Boaler stressed the need for "records of practice," including student work, curriculum materials, videos of classroom teaching, teacher notes, and assessments. "The most powerful impact I've had comes from showing these records of practice." As an example, Boaler showed a video of two classrooms in the same high school. The first classroom, as a result of the math wars, was a class that reverted from using IMP to a traditional approach. The teacher in the classroom is talking while they work out an example, and students sit quietly in rows. Engagement is passive -- at best, the students are listening. The second video Boaler showed was from a classroom down the hall. They were working a problem of a skateboarder spinning off a merry-go-round towards a wall, and the engagement in that classroom was much different. Before the students had solved the problem, the teacher stopped students to share their strategies. Students were active at the board and at their desks, questioning each other or reaffirming each others' strategies. Boaler then showed some of the successes and difficulties she's faced in her own journey as a researcher. Her book, What's Math Got to Do with It?, has brought focus to math education to a widespread audience. Boaler found herself talking on radio shows or in interviews for newspapers with people sharing their traumatic experiences as math students in traditional classrooms. 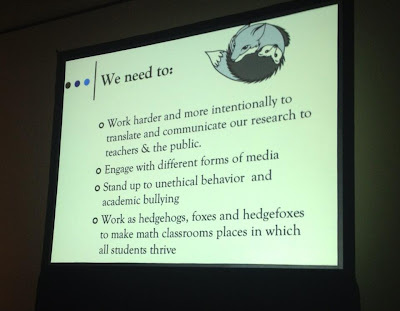 Boaler also decided to reach out to press outlets, writing articles for newspapers, and was invited to speak with politicians about policies regarding math education. In those discussions, Boaler has found many opportunities to share the research of others, including the negative uses of timed tests and tracking. Boaler shared difficulties related to her long-running scuffle with Jim Milgram and other mathematicians who strongly favor a more traditional form of mathematics. Boaler has told much of this story on her website, so I won't recap all of it here. She took this as an opportunity to thank people for the support she's received from so many people, and believes that while it's good to question and disagree, it's not okay to attack and attempt to discredit. There are, and likely will continue to be those in the math community who don't share visions for reform mathematics, as evidenced by this quote from Milgram: "Those of us who actually know the subject strongly believe that in order to improve outcomes we have to dramatically increase teacher knowledge of the subject, and that teachers need to more or less directly impart that knowledge to students." As a field we should work with people who want to cooperate and don't claim that some fields of research are inferior to their own. Turning back towards ways we can improve math education, Boaler looked to new technologies for sharing research and records of practice. She's been working with Udacity and will be offering a course this summer called "How To Learn Math." The course will first be offered to learners, but she will be releasing a teacher version of the course. Boaler has recognized a lot of desire in the Silicon Valley community to improve the way we teach and learn mathematics, but they don't know the body of research in mathematics education to help make that happen. For example, Sebastian Thrun of Udacity once told her, "My friend Bill Gates tells me that algebra is the big problem for students in school." Boaler boldly replied, "Oh, Bill Gates, the math educator told you that, did he?" This opened a long conversation that exposed the curiosity of Thrun and others to find ways to teach math better, and the need to put the expertise of math educators in front of those who can drive change.